Attention-deficit/hyperactivity disorder (ADHD) may account for a wide range of classroom problems of teachers. ADHD is a common childhood neurodevelopmental disorder, which is characterized by impulsivity, hyperactivity, and inattention. The child sufferers perform different than their peers due to their attention-deficit, impulsivity, and inability to organize daily tasks. Other psychological disorders, including mood disorders, anxiety, depression, oppositional defiant disorder, conduct disorder, nocturnal enuresis, tic, and learning disability, are frequently observed in the ADHD cases as comorbid disorders. In the past decades, the theoretical conceptualization of ADHD has moved toward the neurological approaches and suggests that the main problem of these patients is their deficient neurological skills especially the deficiencies in executive functions. Learning behaviors form a construct examined for predicting the academic achievements of students, and numerous studies suggest that learning behaviors play an important role in the academic achievement and improvements in the academic performance of the students. The behavior of children with ADHD adversely affects their performances in the family, society, public, and school, and evokes negative reactions from their families, friends, school personnel, and peers. These behaviors cause serious problems at school and in society, reduce self-confidence, and inspire feelings of incompetence in these children, who may develop secondary disorders such as the communication disorders, academic problems, anxiety, depression, and misdemeanor. Children with ADHD have difficulties in classroom situations, and thus one of the goals of the interventions for students is to bring useful academic experiences. Kutcher et al. proposed the interventional treatment for this disorder in their clinical instructions. This treatment involves medication, cognitive-behavioral therapy, and family therapy. However, the strategies that are based on the cognitive-behavioral interventions for children have not been adequately effective especially concerning the generalization and long-term effects of this disorder. Therefore, there is a need for an effective therapeutic solution to improve the mental abilities and self-efficacy of children suffering from ADHD. A review of the meta-analysis of the effect of nonpharmacologic therapies for ADHD revealed that although medication is the most common treatment for these patients, it faces considerable limitations. For instance, researchers have referred to the lack of knowledge of the long-term effects of medications and their side effects (such as sleep and eating disorders and parents' negative attitude to medicines). There is also little evidence of the effect of medication on the academic skills of these children. Hence, the interests in the alternative and novel therapies have increased in recent years. The conventional standard methods only assess a limited set of abilities, which are necessary for academic achievement and successful life. On the other hand, the comprehensive theory of successful intelligence holds that intelligence consists of the creative skills for coming up with new ideas, analytic skills for analyzing the ideas, and practical skills for trying the ideas. However, the triarchic theory of intelligence and its newer extension known as the “successful intelligence theory” were used in this research to assess the effectiveness of improving the learning behaviors. This theory is one of the most well-known approaches to thinking and intelligence, which was originally formulated by Robert Sternberg. This research is an applied study as regard its goal and a quasi-experiment study (with a pretest and posttest design and a control group) regarding its method. The statistical population for this research included all of the sixth-grade students of the public and private schools of District 15 of Tehran Municipality, who totaled 8274 (4172 boys and 4102 girls). A total of 125 boys and 125 girl sixth-grade classes were identified in District 15. Using the multistage cluster sampling technique, District 15 was randomly selected from cluster one. Afterward, the schools were put in the next cluster, and eventually, four schools were selected as the members of the sample cluster. Moreover, a total of 30 students suffering from ADHD were diagnosed in eight classrooms using Conners' Teacher Rating Scale, and 15 were put in the experimental group, and 15 were put in the control group randomly. The research inclusion criteria were as follows: (1) a mean score of 1.5 (or higher) on Conners' Teacher Rating Scale, (2) a minimum age of 12 years old, and (3) the child's and parents' consent for participation in this research. The exclusion criteria were as follows: (1) being absent from more than two sessions, (2) no cooperation with the researcher, and (3) irregular presence in the training meetings. This 38-item questionnaire was formulated by Connners to enable teachers to diagnose children with ADHD. Teachers rate the questions based on the 4-point Likert scale, and the scores vary from 0 (never) to 3 (frequently). This scale covers the classroom behavior, group participation, and attitude toward authority. Given that this questionnaire is composed of 38 questions, the total score is in the range between 0 and 114. A score, higher than 57, is indicative of the attention-deficit disorder. With an increase in the score, the severity of the disorder in the child increases, vice versa. In Canada, the normative scores on this scale were provided by Conners for children aged between 4 and 11 years in the 4–5, 6–8, and 9–11 years age groups. Conners reported a retest reliability in the range between 0.72 and 0.92 within a month, and a Cronbach's alpha reliability of 0.61–0.95. Abdullahian, Shakeri, and Vothooq assessed the validity of this scale by conducting a principal component analysis and a factor analysis (FA). The Kaiser-Mayer-Olkin for this scale was also satisfactory. The reported reliability of this scale varied between 0.68 and 0.82 using the retest method and between 0.74 and 0.89 using Cronbach's alpha coefficient. The final version of this scale was developed for students aged 5 to 17 by McDermott. The LBS is a truncated teacher rating form that is easily administered and completed by the teachers. This scale consists of 29 questions (positive and negative behaviors in effective learning), which are rated based on the 3-point Likert scale as follows: (2) always displays learning behaviors; (1) sometimes displays learning behaviors; and (0) never displays learning behaviors. The LBS is composed of four subscales as follows: (1) competence motivation; (2) attitude toward learning; (3) attention/persistence; and (4) strategy/flexibility. The construct validity of LBS was confirmed through a FA, and its reliability was reported as follows by McDermott using the retest and Cronbach's alpha method: Cronbach's alpha: competence motivation = 0.85, attitude toward learning = 0.87, attention/persistence = 0.85, strategy, and flexibility = 0.79; Retest method: competence motivation = 0.92, attitude toward learning = 0.91, attention/persistence = 0.92, strategy, and flexibility = 0.93. In Iran, the construct validity of this scale was confirmed by Abedi and Hadi Pour as follows: Cronbach's alpha: competence motivation = 0.83, attitude toward learning = 0.83, attention/persistence = 0.83, strategy, and flexibility = 0.83; Retest method: competence motivation = 0.92, attitude toward learning = 0.91, attention/persistence = 0.83, strategy, and flexibility = 0.92. The successful intelligence program was administered during six sessions. To this end, after identifying the students with ADHD and collecting the samples from eight classrooms, the pretest was conducted on 30 hyperactive students. The executive functions training program was administered on the experimental group, while the control group was on the waiting list. These sessions were held twice a week. In the end, the posttest was conducted on all of the 30 participants. To analyze the data, the descriptive statistics (mean and standard deviation) were used, and on the inferential statistics level, the multivariate covariance analysis approach was employed. [Table 1] presents a summary of the successful intelligence training sessions. In this section, first the descriptive statistics and then the inferential statistics are discussed. [Table 2] presents the descriptive statistical results of the learning behavior variable. As seen in [Table 2], there is a difference between the pretest and posttest scores of the two cohorts. The multivariate covariance analysis method was used to compare the significance of these differences. Before the test, first the hypotheses were tested. The hypotheses were as follows: the normal distribution of the dependent variables was tested using the Shapiro–Wilk test (P > 0.05), and the homogeneity of variances was tested using the Levene's test (P > 0.05). The test results confirmed these hypotheses. Moreover, the correlation between the covariates was moderate. The analysis of the Pearson's correlation between the covariates revealed that the correlation was not higher than 0.41 in any case. The analysis of the F value and the significance level of the effect of interaction between the covariates and the independent variable were also reflective of the insignificance (P > 0.05) of the interactions. Consequently, the assumption about the homogeneity of regression slopes was also true. Hence, multivariate covariance analysis was carried out to compare the posttest scores of the experimental and control groups by controlling the pretest effect on the learning behaviors variable. The results from the multivariate covariance analysis and Pillai's index showed a significant difference between the cohort at least regarding one dependent variable (P > 0.001). 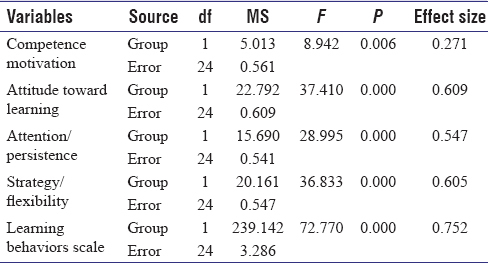 The multivariate covariance analysis was also carried out as part of the multivariate covariance analysis for further assessments [Table 3]. As seen in [Table 3], there are significant differences between the posttest scores of the two cohorts on competence (P < 0.001), attitude to learning (P < 0.001), attention/persistence (P < 0.001), and strategy/flexibility (P < 0.001). Hence, due to the increase in the mean posttest scores of the experimental group as compared to the control group, it is concluded that the successful intelligence program is effective in improving the learning behaviors of the students. The investigation results revealed the executive functions training program, which was based on Anderson's model, improved the learning behaviors. This finding complies with the research by McDermott and Schaefer. Sternberg et al. conducted a study on students in different grades and found that successful intelligence training improved the academic performance of the students; however, this finding does not comply with our findings. Considering the research findings, it could be stated that the recent administration of the successful intelligence program in addition to medication and clinical treatments has captured the attention of more specialists and parents of children with ADHD. It is also worth stating that limitations, such as the purposive selection of the participants, the high attrition of the participants, and the lack of follow-ups, might have influenced the present research findings. In the end, given the effectiveness of the successful intelligence program in improving the learning behaviors, kindergarten instructors, education experts, and occupational therapists are recommended to utilize this program. The findings from this research indicated that the successful intelligence program can positively affect the learning behaviors of the child sufferers of the ADHD through the use of analytic models and practical creative programs. The limitations of the study were included as follows: (1) lack of follow-up and (2) using only self-report questionnaire. Kewley G. Attention Deficit Hyperactivity Disorder: What Can Teachers Do? New York: Routledge; 2010. Association AP. Diagnostic and Statistical Manual of Mental Disorders (DSM-5®). Washington, DC: American Psychiatric Publication; 2013. Barkley RA. Attention-Deficit Hyperactivity Disorder. A Handbook for Diagnosis and Treatment. 4th ed. New York: Guilford Publications; 2014.
van der Veen I, Peetsma T. The development in self-regulated learning behaviour of first-year students in the lowest level of secondary school in the Netherlands. Learn Individ Differ 2009;19:34-46. Atashpoor H, Niazi M. Is ADHD related to smoking in children and adolescents? Q Teach 2001;9:35-7. Renz K, Lorch EP, Milich R, Lemberger C, Bodner A, Welsh R, et al. On-line story representation in boys with attention deficit hyperactivity disorder. J Abnorm Child Psychol 2003;31:93-104. Kutcher S, Aman M, Brooks SJ, Buitelaar J, van Daalen E, Fegert J, et al. International consensus statement on attention-deficit/hyperactivity disorder (ADHD) and disruptive behaviour disorders (DBDs): Clinical implications and treatment practice suggestions. Eur Neuropsychopharmacol 2004;14:11-28. Gevensleben H, Holl B, Albrecht B, Vogel C, Schlamp D, Kratz O, et al. Is neurofeedback an efficacious treatment for ADHD? A randomised controlled clinical trial. J Child Psychol Psychiatry 2009;50:780-9. Sonuga-Barke EJ, Brandeis D, Cortese S, Daley D, Ferrin M, Holtmann M, et al. Nonpharmacological interventions for ADHD: Systematic review and meta-analyses of randomized controlled trials of dietary and psychological treatments. Am J Psychiatry 2013;170:275-89. Raggi VL, Chronis AM. Interventions to address the academic impairment of children and adolescents with ADHD. Clin Child Fam Psychol Rev 2006;9:85-111. Fuchs D, Compton DL, Fuchs LS, Bryant J, Davis GN. Making “secondary intervention” work in a three-tier responsiveness-to-intervention model: Findings from the first-grade longitudinal reading study of the National Research Center on Learning Disabilities. Reading Writing 2008;21:413-36. Sternberg RJ, Grigorenko EL. Teaching for Successful Intelligence: To Increase Student Learning and Achievement. Canada, Ontario: Corwin Press; 2007. Gottfredson LS. Dissecting practical intelligence theory: Its claims and evidence. Intell 2003;31:343-97. Sternberg RJ, Grigorenko EL, Jarvin L. Improving reading instruction: The triarchic model. Educ Leadersh 2001;58:48-52. Sternberg RJ. Successful intelligence: A model for testing intelligence beyond IQ tests. Eur J Educ Psychol 2015;8:76-84. Sternberg R, Grigorenko E. The cognitive costs of physical and mental ill health: Applying the psychology of the developed world to the problems of the developing world. Eye Psi Chi 1997;2:20-7. Conners CK. Clinical use of rating scales in diagnosis and treatment of attention-deficit/hyperactivity disorder. Pediatr Clin North Am 1999;46:857-70, vi. Abdollahian E, Shakeri MT, Vosoogh E. A study of attention deficit hyperactivity disorder (ADHD) prevalence in pre-school age children from March 2003 to June 2003 in Mashhad. J Mashad Univ Med Sci 2004;85:275-80. McDermott PA. National scales of differential learning behaviours among American children and adolescents. Sch Psychol Rev 1999;28:280. Abedi A, Hadi Pour M. An assessment of reliability, validity, and factor structure of Persian form of learning behaviours scale on middle school students. Q Educ Meas 2013;3:23-40. Clark C, Prior M, Kinsella G. The relationship between executive function abilities, adaptive behaviour, and academic achievement in children with externalising behaviour problems. J Child Psychol Psychiatry 2002;43:785-96. Greene BA, Miller RB, Crowson HM, Duke BL, Akey KL. Predicting high school students' cognitive engagement and achievement: Contributions of classroom perceptions and motivation. Contemp Educ Psychol 2004;29:462-82. Hart T, Jacobs HE. Rehabilitation and management of behavioral disturbances following frontal lobe injury. J Head Trauma Rehabil 1993;8:1-12. Latzman RD, Elkovitch N, Young J, Clark LA. The contribution of executive functioning to academic achievement among male adolescents. J Clin Exp Neuropsychol 2010;32:455-62. St. Clair-Thompson HL, Gathercole SE. Executive functions and achievements in school: Shifting, updating, inhibition, and working memory. Q J Exp Psychol (Hove) 2006;59:745-59. Sternberg RJ. The theory of successful intelligence and its implications for language aptitude testing. Individ Differ Instructed Lang Learn 2002;2:13-44. Sternberg RJ. Raising the achievement of all students: Teaching for successful intelligence. Educ Psychol Rev 2002;14:383-93. Sternberg RJ, Torff B, Grigorenko E. Teaching for successful intelligence raises school achievement. Phi Delta Kappan 1998;79:667-9. Schaefer BA. A demographic survey of learning behaviours among American students. Sch Psychol Rev 2004;33:481-97.